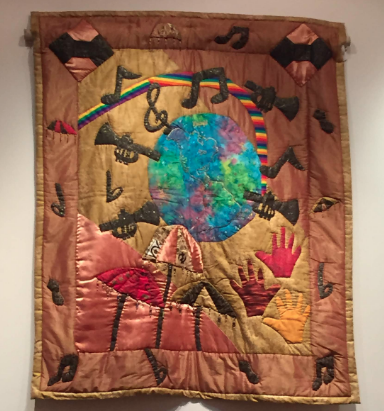 On Thursday, Dec. 6, the public is invited to a holiday happy hour at an exhibition of traditional American and Afro-Caribbean inspired quilts at CANO’s Creative Space at Myrtle Banks Building, above the Dryades Market on the third floor at 1307 Oretha Castle Haley Blvd. 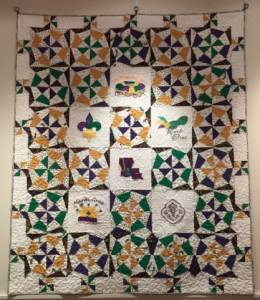 CANO welcomes the Gee’s Bend Quilters Collective from Alabama to New Orleans as they prepare to give a three-day workshop for New Orleans quilters at Ashe’s Power House Theater at 1731 Baronne St.
Cecilia Pedescleaux and other quilt artists take inspiration from the past while introducing new techniques. “There are now so many new techniques that would not have been thought of as quilting in the past,” Pedescleaux said. “It’s not your grandmother’s quilting anymore. “We get together to work collaboratively on new creative elements. If you can’t paint or sculpt, this is something you can do, and it is portable.” she said. January. Hours for viewing from 9 to 5 on weekdays and by appointment. More quilts will also be on view in Ashe facilities Dec. 6-9.